Salespeople constantly put themselves out there, and no one is safe of fear of rejection. He's not alone. Salespeople everywhere experience the same challenges, and business owners struggle to help them make sales. It’s time to change that. We live in a culture where career success is often directly linked to self-worth, and we all want to be accepted and loved. Fear is our signal that we’re putting ourselves out there, and when we do, we risk failure. Humans are great storytellers; so, many of us make up stories. If I can’t make the sale, I’ll lose my job. If I lose my job, I won’t be able to make ends meet, my spouse won’t be attracted to me and my parents will have proof I can never amount to anything. “Salespeople exhibit a lot of the same qualities of people who are depressed,” Weiss said. Mind Reading: According to Weiss, salespeople assume prospects aren’t interested based on no realistic reason. Fortune Telling: Salespeople are “projecting into the future, thinking ‘nobody will be interested, therefore I won’t make any phone calls,’” Weiss said. Fortunately, there’s plenty a business owner can do to help salespeople overcome fear of rejection and win the sale. Don Surath, author of Conquering Cold-Calling Fear: Before and After the Sale and a multimedia solution developer at CBS, never gave anyone in his university courses a grade higher than a 93. But one student got a 98 – and it wasn’t a stereotypical salesperson. “This boy wasn’t good-looking. He’s never been popular. And he had a heart condition, so he had to miss a few classes because of treatments,” Surath said. Yet he was the only one of 50 students to land a sales meeting. Encourage your salespeople to stop making assumptions. For example, salespeople need to qualify prospects, but “the definition of a cold call is calling someone you do not know, so you can’t know what they’re thinking,” Weiss said. Ask your salespeople, “‘Is this fear you have about what’s going to happen when you dial – is it real or are you making it up?’ If people can shift how they think about it, they can shift the behavior,” Weiss said. When you’re afraid, it’s easy to assume you’re the only one experiencing this challenge, which makes things worse. As the business owner, share the team average of the number of calls it takes to get a “yes,” so your salespeople know they’re not alone. 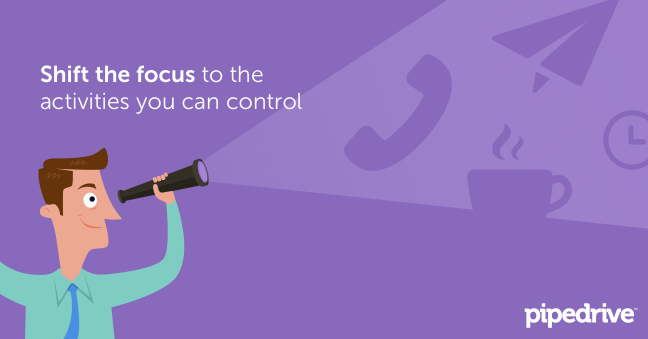 Shift the focus from the result they can’t control (a closed sale) to the action they can control (picking up the phone). “If you make 20 calls a day for five days, you’ll get rid of fear, and you’ll have success: you’ll get three appointments and one sale,” Surath said. Many salespeople can’t stop associating selling with scheming people out of their money just because they took a sales job. Help them out by sharing case studies of customer success, to prove your products help real people and companies, and get them excited about delivering value. When Surath challenged his students to land a sales meeting, “a lot of people picked the president of Google or Facebook,” he said. None of them landed a meeting. Remember the only student who got 98 in Surath’s class? He picked the president of a local brewery – and landed a meeting. Help your salespeople build their confidence by giving them skills to qualify prospects, explain value, handle objections and follow up better. Surath suggested taking the pressure off. “Decide who’s the person you absolutely want to call – and don’t call them first. Practice with other people you don’t care about,” he said. Give your salespeople a script to read during calls. Explain to them that “people can’t see you. They don’t know you’re reading,” Surath said. By the time they begin calling the high-stakes prospects, it’ll become second nature. As every business owner knows, rejection will happen. Once your salespeople face their fears and make the call, how can you help them deal with the inevitable “no”? “It’s very interesting what salespeople think about ‘no,’” Weiss said. Her clients often tell her prospects aren’t interested, and when she asks for more information, she learns the prospect was in a meeting or asked to call next week. Sometimes your salespeople reach a prospect at a bad time, “but if they’re in the heart of terror, they think they’re being rejected,” Weiss said. When her client realized this, he changed jobs and improved his relationships with his wife and family. He chose to stay in sales, and he’s now happy and reaching his sales goals. “When people ask what I do, I say, ‘I call people who don’t want to talk to me.’ You have to give yourself credit for this courage. A lot of people don’t go into this because they’re scared,” Surath said. Encourage your salespeople to celebrate their courage. If it takes your salespeople an average of 100 calls to close a sale, a salesperson who faced her fears and made one call only has 99 calls left to make. “It’s a pretty cool job. Your time is your own. You make more money. The company pays for you to take people to dinner and games. I got free tickets to the Super Bowl opening night in San Jose, California, because I work at CBS. I took my best clients to the game, bought them hot dogs – and CBS paid for this. People who are not in sales don’t get these perks,” Surath said.